If you’re mentoring a Fulton Schools undergraduate student, consider encouraging them to apply for FURI funding for summer 2018, fall 2018 or spring 2019. 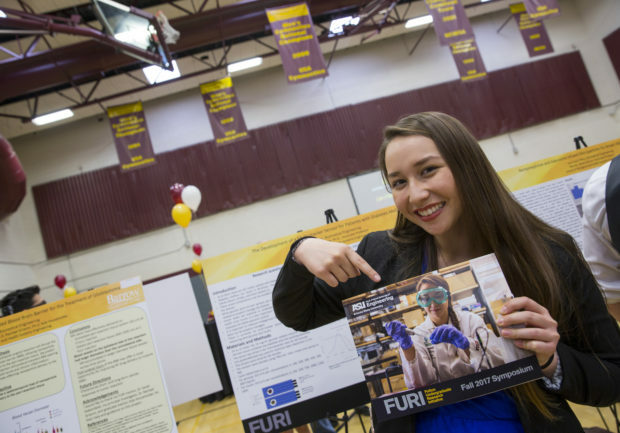 FURI students receive a $1,500 stipend, mentors receive $500 per student for up to five students and FURI students may apply for up to $400 in research supply funding. Students must apply by noon on Wednesday, March 14, 2018. Faculty mentors must submit support letters by 8 a.m. on Thursday, March 15, 2018. The Fulton Undergraduate Research Initiative is an opportunity for students to work with Fulton Schools faculty members on research. Students can pursue fields that have to do with their engineering major, they can work under a faculty member with a project that interests them or they can try a research field that is completely new and different. Learn more by checking out the FURI website, reviewing the application guide and/or attending an Unwrapping Research Workshop. Save the date: Spring 2018 FURI Symposium, Friday, April 20, 2018. Questions? Contact Cortney Loui, coordinator, at furi@asu.edu.